AFTER six days, only TWO teams are left competing in GBRow2013 the world’s toughest rowing race. Four have been forced to quit in the six days since the race started. The Islanders – four men from Essex, Guernsey and Ireland – are still leading the gruelling 2,000-mile non-stop race around the mainland of Britain. Despite spending much of the day at anchor in the Bristol Channel in the their boat, Black Oyster, The Islanders are still well ahead of world record schedule. Their nearest rivals, second placed Oarsome Adventures, were forced to quit the race today after suffering damage to their steering system, which left their 26-foot-long boat Boudica, floundering in rough seas 40 miles off the Cornish coast. Padstow RNLI lifeboat crew went to the assistance of Oarsome Adventures, which has a crew of six, four men and two women. Four days ago in the English Channel, skipper Mikey Buckley from Leeds, managed to repair the boat’s steering system using a piece of flagpole and duct tape. But the rough seas and high winds in the Celtic Sea wrecked the steering ram again but this time the damage was irreparable. This evening Buckley and his crew, Heather Rees-Gaunt, Karl Steans, Ian Kavanagh, Sam Clemmens and 20-year-old Beatrix Parry from West Wales were safe in Padstow after the local RNLI boat towed Boudica to the Camel Estuary. Meanwhile, the only remaining pair in the race, Jason McKinlay and Josh Tarr, from Salcombe, Devon are in second place ion their boat, Savoir Faire. 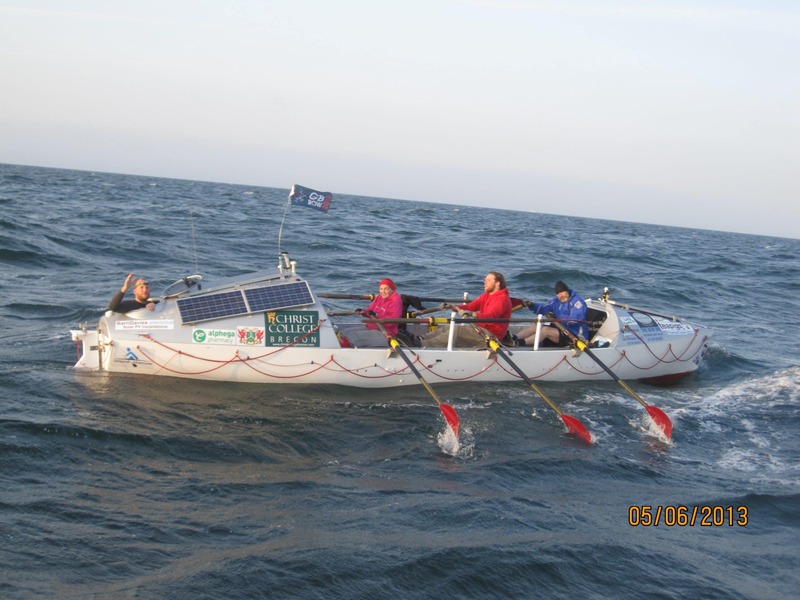 Tonight they are around 50 miles from the Lizard, the most southerly point in the race. There is one more crew rowing around Britain, team Pure Gym. Under race rules, they can no longer compete for prizes because they were rescued yesterday by Salcombe lifeboat after the electrical system on their boat suffered a complete failure. 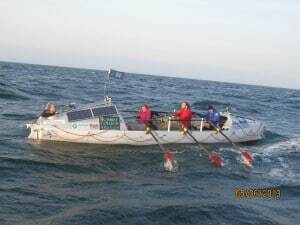 After repairs were carried out last night, Pure Gym’s crew, skipper Claire Shouksmith, from Bouremouth, Steve Paterson, from Oxford, Ingrid Kvale, from Bristol and Stuart Chamberlayne, of Couldson, Surrey set off again this morning to continue rowing around Britain.